Ed. Note: Please enjoy a post on National Tartan Day, parts of which have appeared before on our blog. Thursday, April 6th is National Tartan Day. Some of our readers live, breathe, eat and sleep tartans. They are steeped in their clan histories. They know the difference between the ancient, dress, hunting and standard versions of their clan’s tartan. But other readers aren’t quite sure of what exactly makes a tartan a tartan. How does a tartan differ from any other plaid? We say it best with the title of one of our most popular Pinterest boards: All tartans are plaids, but not all plaids are tartans. A tartan looks like a plaid, but it is so much more than that. 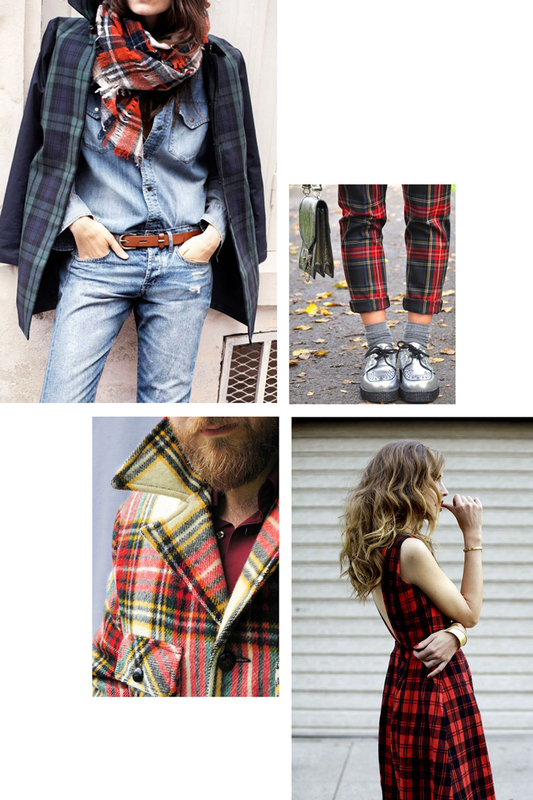 A tartan is a statement of identity. Tartans were originally regional designs, worn as “plaids,” pieces of fabric worn slung over the shoulder. Scotland’s warriors wore their plaids with pride to announce their family affiliations and political loyalties. The Dress Act of 1746 was enacted to prohibit the wearing of the plaid, as part of colonial suppression of the Highlands: That from and after the first day of August, One thousand, seven hundred and forty-six, no man or boy within that part of Britain called Scotland, other than such as shall be employed as Officers and Soldiers in His Majesty’s Forces, shall, on any pretext whatever, wear or put on the clothes commonly called Highland clothes (that is to say) the Plaid, Philabeg, or little Kilt, Trowse, Shoulder-belts, or any part whatever of what peculiarly belongs to the Highland Garb; and that no tartan or party-coloured plaid of stuff shall be used for Great Coats or upper coats, and if any such person shall presume after the said first day of August, to wear or put on the aforesaid garment or any part of them, every such person so offending … For the first offence,shall be liable to be imprisoned for 6 months, and on the second offence, to be transported to any of His Majesty’s plantations beyond the seas, there to remain for the space of seven years. That’s right, tartans were illegal; inflammatory and subversive. If you’re not a history buff, but you watch Outlander , you already know this. In 1782, the Dress Act was repealed through the following proclamation: Listen Men. This is bringing before all the Sons of the Gael, the King and Parliament of Britain have forever abolished the act against the Highland Dress; which came down to the Clans from the beginning of the world to the year 1746. This must bring great joy to every Highland Heart. You are no longer bound down to the unmanly dress of the Lowlander. This is declaring to every Man, young and old, simple and gentle, that they may after this put on and wear the Truis, the Little Kilt, the Coat, and the Striped Hose, as also the Belted Plaid, without fear of the Law of the Realm or the spite of the enemies. When the Dress Act was repealed in 1782, tartans were no longer worn as ordinary Highland dress. They were adopted as the official national dress of Scotland. Tartan grew from regional plaid to warrior garb to a badge of kinship. These patterns are a visual illustration of the bond between personal and political freedom. We’re not tartan experts at Pendleton, just fabric experts. When we we use these designs, we do it with respect for the history of the design we’re using. Our designers refer to rare reference books stored under archival conditions in our design department (please don’t ask to see them because they will not hold up to visitors, we have to say no). We also use modern tartans, like Canada’s Maple Leaf, and our own Pendleton Hunting Tartan, registered with the Scottish Tartan Society in 1999. Tartans have been part of the Pendleton offering since our earliest days, beginning with our motor robes. We call them that because we originally wove them to cover the laps of motorists in the earliest days of the automobile. We’ve been making tartan shirts, Topsters, motoring caps and robes for men since the 1920s. Women have always been part of the Pendleton tartan action, as well. Today, tartans have taken fashion by storm, because these patterns are timeless, we return to them. If you’re wanting to add tartan, but you’re not sure where to start, try Black Watch tartan, the tartan designed to look black from a distance (pictured is a vintage Pendleton shirt, get a new one from us here — or here, if you want a Sir Pendleton!). This is also known at the Government or 42nd tartan, developed to wear by the Black Watch, one of the early Highland Independent Companies. From a distance, the pattern reads black. It’s the stealth tartan. Around here, we call it Highland Camo, and though it’s one of our perennial bestsellers, it’s a challenge to photograph for a catalog. But we do, as you can see if you pay us a visit at pendleton-usa.com. We have tartan items galore for women, men, and home. We hope your National Tartan Day is a good one, and remember: Wear Your Plaid With Pride.